With election season in full swing, we have all heard a lot about plans to lower the national debt. There are lots of strategies being proposed, and talked about, but none have focused on investing in high-quality early education as a way to decrease the debt. In his 2011 book, Investing in Kids, Dr. Timothy Bartik analyzed just how effective investing in high-quality early education can be. 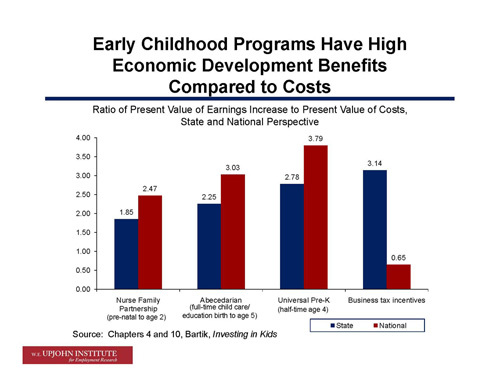 In his analysis, he found that high-quality early education investments will reduce the national debt more effectively than business tax incentives (a strategy that is often discussed) will.